Education, knowledge. Learning new skills, pursuing bigger understanding. 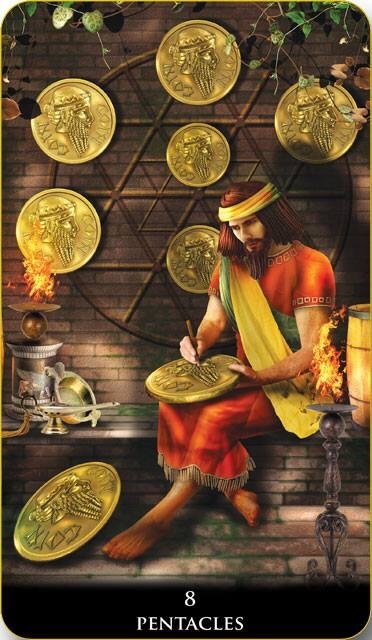 A man crafting a pentacle that he holds on his lap is depicted in this card. Six other pentacles mounted on the wall behind the man, and one pentacle lies on the ground at his feet. It is evident that the artist approaches his work methodically, learning new skills and pursuing more significant understanding. – looking for extra information. This entry was posted in Artist, Deck Review, Featured Card of the Day, General Tarot, Readings and tagged 8 of Pentacles, New Babylonian, Roxana Paul, Tarot.